Who for – The Level 3 Award in Emergency Paediatric First Aid has been developed for candidates working in childcare, or those otherwise responsible for caring for infants and children, who are not required to have an Ofsted/EYFS qualification but want to learn about emergency paediatric first aid. While this qualification does not meet Ofsted/EYFS requirements for childcare professionals, it can contribute to the required 12 hours of training if candidates subsequently wish to attain the Level 3 Award in Paediatric First Aid. 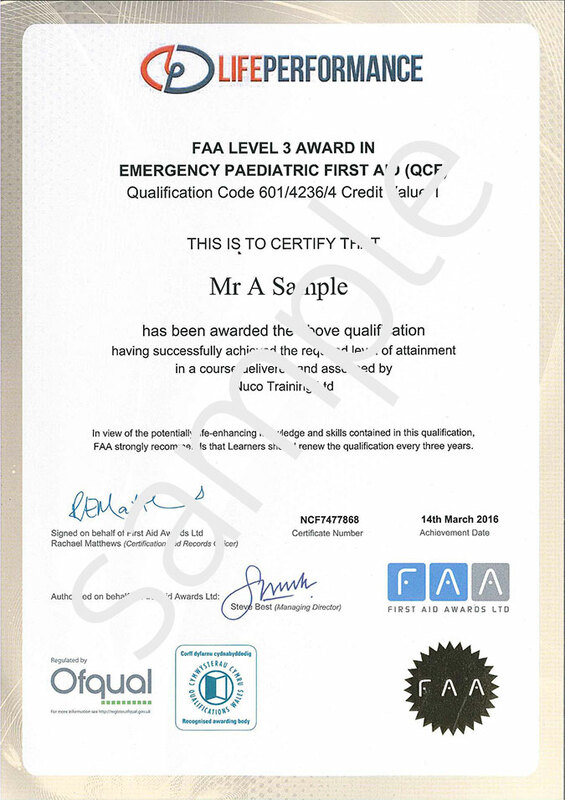 Awarding body – Ofqual, FAA level 3. Legislation, first aid provision, responsibilities, scene assessment, hygiene, priorities, first aid kits, reporting, primary and secondary assessment, unconscious casualty, airway management, recovery position, cpr, choking, epilepsy, shock, fainting, bleed control, burns, embedded objects, splinters.